Does your heart burn with a deep desire to know and worship God? Be captivated with this album Passionate Pursuit of God's Presence. Embark on a journey - a passionate pursuit of God Himself. Join in relentless pursuit as we touch His heart and abandon all for the One who has captured our affection. When we lift our inward eyes to gaze upon God we are sure to meet friendly eyes gazing back at us, for it is written that the eyes of the Lord run to and fro throughout all the earth. The sweet language of experience is "Thou God seest me." When the eyes of the soul looking out meet the eyes of God looking in, heaven has begun right here on this earth. Our pursuit of God is successful just because He is forever seeking to manifest Himself to us. A generation of Christians reared among push buttons and automatic machines is impatient of slower and less direct methods of reaching their goals. We have been trying to apply machineage methods to our relations with God. We read our chapter, have our short devotions and rush away, hoping to make up for our deep inward bankruptcy by attending another gospel meeting or listening to another thrilling story told by a religious adventurer lately returned from afar. The tragic results of this spirit are all about us. Shallow lives, hollow religious philosophies, the preponderance of the element of fun in gospel meetings, the glorification of men, trust in religious externalities, quasi-religious fellowships, salesmanship methods, the mistaking of dynamic personality for the power of the Spirit: these and such as these are the symptoms of an evil disease, a deep and serious malady of the soul. To great sections of the Church the art of worship has been lost entirely, and in its place has come that strange and foreign thing called the "program". This word has been borrowed from the stage and applied with sad wisdom to the type of public service which now passes for worship among us. Let us practice the fine art of making every work a priestly ministration. Let us believe that God is in all our simple deeds and learn to find Him there. The pursuit of God will embrace the labor of bringing our total personality into conformity to His. The moment we make up our minds that we are going on with this determination to exalt God over all we step out of the world's parade. Excerpts from A.W. Tozer - The Pursuit of God. The song you are listening to on this page is available as a free music player (as seen on the left). 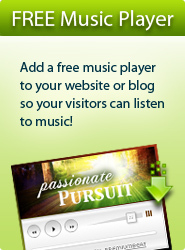 Click here for easy instructions on how to add this music player to your own website or blog! Free worship and spontaneous songs recorded live at Pursuit. Passionate worship songs to draw our hearts close to His. With all my mind - I will build You a house of thoughts to dwell in. With all my strength - I will not give my years to the cruel one. With all my soul - I will guard the affections of my heart with all diligence least they set themselves on worthless pursuits. Maker of men - While others worship Your creation, I will worship You. You have given us many good things to enjoy, but they can never take Your place in my heart. Passion of my heart - Why are people so afraid of passion in worship? Why does it make them uncomfortable? Is it because it exposes their own lack of intimacy with You? Desire of the Ages - Why don’t people hunger for You? Maybe they have never tasted. Your presence Lord is everything to me, please meet with me. Waken my heart - We need our hearts awakened. How can we sleep when the Bride groom cometh! To know you more - I get so caught up in "doing" when I should be caught up in "knowing". One dream, one hope, my one reward. I press toward the mark for the prize of the high calling of God in Christ Jesus. This song has become our church's theme song. It was birthed by the Spirit of God as we were preparing our hearts. "Your music is definitely inspired. I am so moved whenever I listen to it. It draws me into a realm of prayer and reflection. You have helped me find help in my time of need." "After listening to one song, I didn't go any farther! I can tell you have a heart in passionate pursuit of God. I love to worship and your music is so conducive to personal worship. Thank you so much!" "Your songs are amazing, and wonderfully prayerful and creative… I've found no site with better prayer music than yours."